I was the 131st voter this morning at my polling place at 7:15 am. Wow. I actually witnessed a medium-sized argumentive confrontation with a poll volunteer/voter. I’ve never seen an Election Day so passionate with my neighbors, except when Obama was elected the first time, and back in college in Kansas, when I voted for the first time (Mr. Clinton was running). It’s pie day for me. Sweet (and savory) Stolles, please don’t fail me now! 3 minutes later: Definitely no complaints here. Once again, Stolles is a master of comfort sweet and savory goodness. The chicken, along with its beautifully carved doughy cover, is filled with chicken, rice (yes, nice! ), onion, dill and parsley in a light mayonnaise sauce. And the apple? 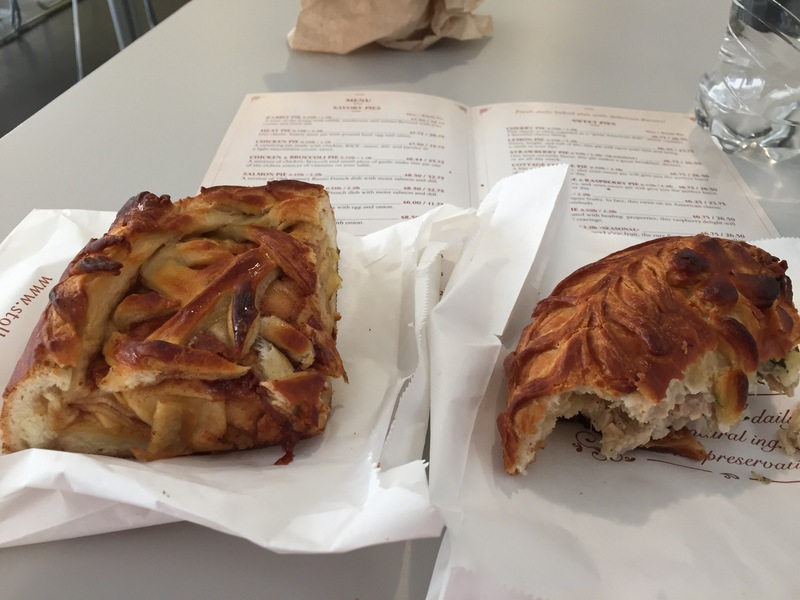 So amazing….thin slivers of apples under a lattice-like pouch of dough, with cinnamon, nutmeg (? ), and just a little sugar, to honor the American Classic with its subtle, Eastern European mentality. I want to savor these flavors all day long, but time is a-wasting. Happy Election Day (go vote!) and enjoy!